I asked myself these questions when I was preparing for a talk that I was giving at the Rochester Institute of Technology on innovation and economic development. 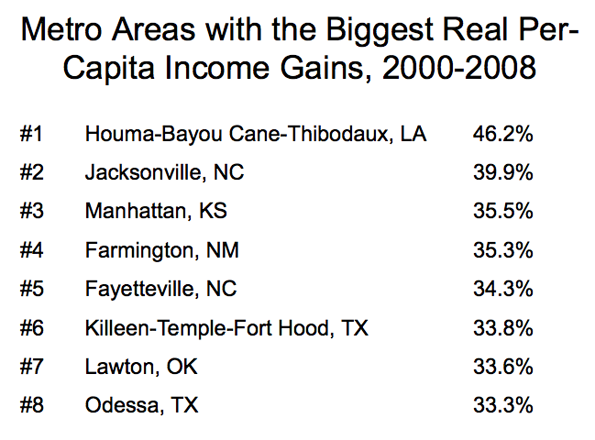 Being a man of numbers, I calculated the gains in real-per capita income for all metro areas. Who do you think was #1, and who do you think was #366 (out of 366)? Mike Mandel is Editor-in-Chief of Visible Economy. This post originally appeared on his blog "Mandel on Innovation and Growth." Submitted by tebici on Thu, 05/13/2010 - 08:27. Some folks have actually theorized that "real incomes" would be lower in higher demand areas. I.e. people are willing to pay more of their income to live in a desirable place (more for housing; more for retail rents which translates into more for coffee). In addition the trend of moving somewhere first because the place is desirable and then finding a job is consistent with college educated young people scraping by waiting tables until they find a job in their field but the benefit is that they get to live where they want to live. Similarly people may be more reluctant to move away, even if they lose their job, if they find their living situation desirable. Basically you have to give someone a higher "real income" so they can buy more widgets if they have to live in a place with fewer entertainment and lifestyle amenities (akin to paying a person more to work in the arctic circle; sure you get paid 200k / year but you live in a frozen cocoon). Similarly if the cost of living is really low; it may be because there is very low demand for housing and property because it is not considered highly desirable. 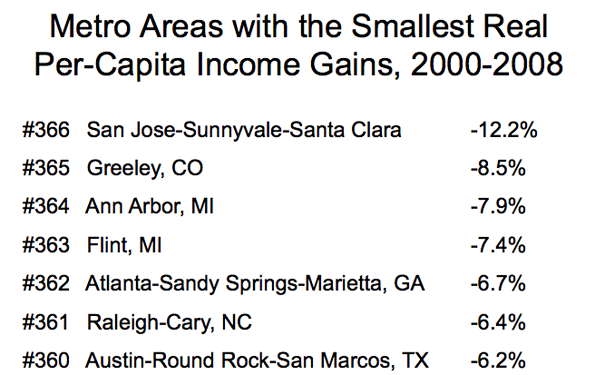 This results in a higher "real income" not because incomes are high but because costs are low. While lower costs is a legitimate benefit we should not assume those with lower "real incomes" are worse off if they have chosen to make a tradeoff between a lower real income and choosing a preferred lifestyle or location. There are other reasons people accept lower real incomes as well that may correlate to higher education levels such as interest in nonprofit enterprises or choosing a job in which they prefer the everyday work over a job with the highest income they could achieve based on their education (e.g. entertainment industry tends to be low paid because so many people find it desirable work (especially when you take into account unemployment and inconsistent employment; in that industry there continues to be a large supply of workers despite low wages; you might find similar results among entrepreneurs who would rather be their own boss than accept a higher, steadier income in a corporate work environment). Submitted by bobwilson1977 on Thu, 05/13/2010 - 13:13. The places and lifestyles people choose are highly subjective. You seem to be saying that someone choosing to have a higher "real income" is doing so at a trade-off in terms of their access to entertainment and "Lifestyle amenities", thus perhaps those who choose to I assume sacrifice for a lower real income are compensated with access to those amenities? I find that argument strange mainly because I have experienced both lifestyles. I grew up in a very rural part of the South and moved to San Francisco in my early 20's where I've been for 10 years thus far. I can honestly say that I fail to see one area having any sort of real advantage over the other. I never once felt that I was somehow missing out on life by living in the sticks. Its not like I sat around twiddling my thumbs just wishing I could have more "entertainment" in my life. I stayed pretty busy and ran a small repair business. We swam in the nearby lake, went hiking, ate at local restaurants, went to local music festivals, and so on. If people in such places felt like they were so deprived they'd move en mass. Yet many purposelessly choose to live as they do and in most cases wouldn't want to live in some major expensive metro. The problem is that 90% of the people I know have never lived anywhere else except in environments they are familiar with. If they move, its to another metro or another rural town with as many similarities as they can find to make their move easier to digest. Thus you have this notion that these " Higher real income" areas are as such because they lack the things they feel they must have simply because they don't like change or can't make changes themselves. All I can say is that after living in both places, they both have wonderful things going on for them. But after 10 years of San Francisco I can say that my quality of life in general has been far worse than when I lived in a rural area. As a result I'm probably moving back towards that direction because I can live in either and one and be perfectly happy. Its just that where I live now costs an absolute arm and leg and I fail to see this greatly benefiting my life. Submitted by tebici on Fri, 08/20/2010 - 10:18. Preferences certainly are incredibly subjective and incredibly complex. That doesn't mean they aren't relevant. The way economics works is that if more people value something it goes up in price. That doesn't mean that everybody values that thing or that everyone values something for the same reason. If you try to sell me a fancy fishing rod I'm going to offer you about $15 because my talent and interest in fishing doesn't merit any higher price (and you're probably not going to sell it me); however to a fishing hobbyist it could run in the $100s in value. Enjoying fishing is certainly subjective but it adds up to big bucks for fancy fishing rod manufacturers. The fact that I don't value it doesn't put them out of business. The housing market is more complex because everyone needs housing and they all have different priorities. Some people will move to Portland because that's the only place they can find a job (or more likely the job they want). Some people will move because it's the lifestyle they want or family or friends are nearby. For most people it will be a complex combination of reasons all weighted differently. All the action happens at margin where one factor tips a percentage of people over the line. But just as people don't move solely based on entertainment value, they also don't move solely based on real income. Similarly I think a lot of people do value rural or small town lifestyles and as a result forgo heading to the more populous areas even though their incomes would be higher. Same deal. My experience has been the opposite of yours. I find huge differences in lifestyle between living in southern suburbs versus living in New York and Boston and in living in different neighborhoods within a metro and I have friends and neighbors who have similar experiences. Tuesday a friend described falling in love with Denver and seemed like he'd move that minute if he got the chance. Another friend, a lawyer, is moving out of New York because she's tired of the fast pace even though it means taking a pay cut. Most of my friends have moved from more suburban or rural to more urban areas whether it be in the same or different metro areas, largely looking for work, so moving from like situation to like situation usually wasn't an option. I live in a quasi-urban southern city because my job is to fix broken places, and I actually chose the southeast over L.A. in part because my real income would have been lower in L.A. and in part because the location I chose was closer to my family. I narrowed it to those two cities based largely on professional interest. I absolutely chose my neighborhood based on lifestyle and as a result pay almost as much in rent as I would have up north. If I was in some less geography oriented profession, say a doctor or an accountant, I would probably live in Boston because it's a heck of a lot more fun and I could sell my car. I acknowledge that's my personal preference. However if price reflects the preferences of a large number of people then it would reasonable to read that higher rents may mean there is something enough people value in a particular location and rather than assuming they are victims of a preference-immune housing market. (The housing market is also incredibly complex but individual lifestyle preferences certainly play a role.) Great city life isn't the only thing besides income that gets people to move. Some people move to the Sunbelt for the weather. The place you're describing sounds very idyllic. There is a lot of suburban america that is not nearly so idyllic. Many people value the city and nature; it's the middlescape that's less clear. Many people, especially young people, live in generic apartments in the suburbs having neither access to nature nor the free entertainments of living in the city.